The height of the summer is the month of the red ruby. Many people don't realize sapphires and rubies are the same stone, but are just called different names based on their hue. 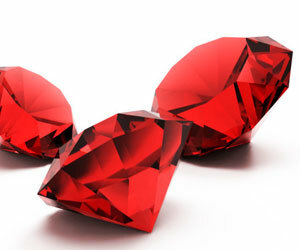 According to folklore, ruby gives the July-born undying vigor, and is a symbol of passion. The best quality rubies come from Burma, where they are believed to have been mined from prehistoric times. Rubies range in color from a light pink to blood-red.